Constructing an effective and professional resume can be a bit challenging, especially to those who are novices in the job application industry. However, one important goal that every job seeker should aim is standing out above others. In this, you will have a higher chance towards the next level, and that is getting a spot for an interview. Regardless of how extensive your past experiences are, how competitive and high-level your skills and qualifications if your resume is not as compelling and effective as it is, it’ll all be useless. So if you’re ready to set your foot in a competitive world of job seeking, make sure you have a proper tool, and that is having an effective and professional resume. When applying for a job, always make sure to have a polished and professional resume, otherwise, prospective employers won’t even bother to scan up your resume. Make sure that it is readable, observing proper and consistent formatting, free from jargons, and fonts should be appropriate as well. Here are some helpful tips that you can follow in making a professional resume. Have a coherent resume. Make sure that it is readable. It is important that employers will have an easy flow of reading and absorbing your achievements and work history. So, make use of legible font. You also need to make sure that there is enough space on the page for an easier scan. Always be consistent. Having a consistent formatting is what a professional resume should have. If you use bullet points in describing your skills and qualifications, make sure to use the same style all throughout. Maintain a focused detail. This is highly necessary, as much as possible, don’t include irrelevant information. The resume should focus on the skills and attributes. 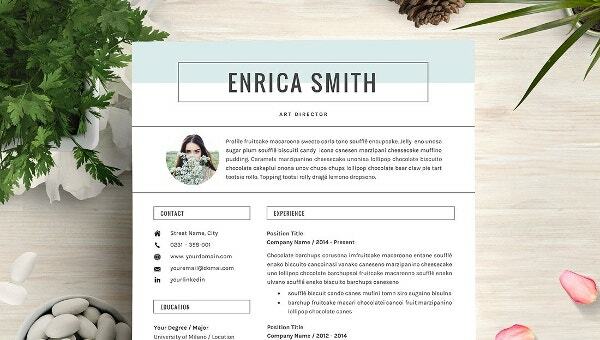 For a great example of what a professional and modern resume looks like, we got Modern Resume Templates that are available for use. These are pre-made and pre-formatted templates. In every job application, first impressions count. And that first impression towards hiring managers greatly depends on how you present your resume. Take it as your one and only chance in enticing a hiring manager’s attention. Otherwise, it’ll be thrown into the rejected file, and that is the main thing we should avoid. It is imperative to make your resume as compelling and enticing as can be. This is because statistics show that it only takes a few seconds for hiring managers to look at your resume. So make the most out of it. Furthermore, in this progressively competitive job industry, having a professional resume that comprises all essential information and stands out against other resumes is the main goal. It is, therefore, very important to make certain that all those years you have been working and studying should be presented well and professionally in your resume. For your resume format and sample needs, here in Template.net, we offer best resume sample templates that you can make use! This will surely give you a way of drawing hiring manager’s attention. These are edit-friendly too! So what are you waiting for, download now!